Bubo and I took a little jaunt up to Saratoga Springs for the week. I wanted to visit some old haunts of Clothilde, a dubious relation on my mother’s side known for her great luck with the gee-gees. That’s racing horses, dears. Saratoga Springs is rather known for the horse races. Ensconced in a delightful manor with a view of Congress Park, this morning’s rain brought a shine to the smaragdine vegetation just coming into Spring glory. Saratoga Spring’s Congress Park has a gorgeous wooden carousel whose horses were carved by Marcus Charles Illions in 1910. You might be surprised to learn that Bubo is a huge fan of carousels. Smaragdine is an adjective meaning of or relating to emeralds or having the color of emeralds; emerald green. Originating from the Greek smaragdinos, from smaragdos – emerald green. 1. I speak no lies, but what is true and most certain. 2. What is below is like that which is above, and what is above is like that which is below, to accomplish the miracles of the one thing. 3. And as all things were produced by the mediation of one Being, so all things were produced from this one thing by adaptation. 4. Its father is the Sun, its mother is the Moon; the wind carries it in its belly, its nurse is the Earth. 5. It is the cause of all perfection throughout the whole world. 6. Its power is perfect if it be changed into action. 7. Separate the earth from the fire, the subtle from the gross, acting prudently and with judgement. 8. Ascend with the greatest sagacity from the earth to heaven, and then again descend to the earth, and unite together the powers of things superior and things inferior. Thus you will obtain the glory of the whole world, and all obscurity will fly far away from you. 9. This thing is the fortitude of all fortitude, because it overcomes all subtle things, and penetrates every solid thing. 10. Thus were all things created. 11. Thence proceed wonderful adaptations which are produced in this way. 12. Therefore am I called Hermes Trismegistus, possessing the three parts of the philosophy of the whole world. 13. That which I had to say concerning the operation of the Sun is completed. It appears, however, that The Smaragdine Table is a medieval forgery – Alexander the Great did not find this emerald green tablet of knowledge in the tomb of Hermes. But it’s a delightful legend, no? And the word feels like good bourbon when it rolls around your tongue. Use it at a party, won’t you? 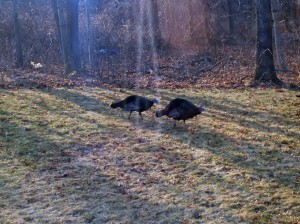 Great Aunt Una sent some photos of the wild turkeys in their Spring Display. I suggested she quit calling to them after boxes of chocolate worms were left on her back porch. That Una, ever the romantic, she thought it was rather sweet. But everyone knows Spring is not the time to trifle with a blue headed male turkey. Well. The Vernal Equinox was a veritable explosion of spring here in Brooklyn. Trees a-bloom, the sun ablaze, birds a-twitter, and everyone seemed to have a spring in their steps. Today is grey and slightly damp. It feels like a wet day at the beach, and the inexplicably circling seagulls are not helping dissuade those feelings. The entire house feels a bit subdued and groggy, like every creature within its walls has missed a nap. For her part, Bubo is entrenched in nidulation. Nidulation is a noun meaning nesting; nest-building; the time of remaining in the nest. It primarily refers to birds, but I’m sure one could use it for humans – often as the seasons change we experience a period of nidulation or “nesting”. Nidulation is considered an obsolete word, and hails from the Latin nidulatus plus the English -ion. Bubo is quite fastidious when it comes to her nest. No one – not even yours truly – is allowed in and she is incredibly particular. With the seagulls circling and the weather as it is, today is a perfect day for nidulation. I have spent the day in the library, reading and sipping tea. My nest, one could argue, is a wing back upholstered in a rather dark and garish brocade. It smells faintly of tobacco and port. It’s delightful.